Standard duty copper-plated battery clamps. Includes positive and negative clamps. Accepts up to #8 gauge cable. Heavy duty construction and easy grip handles. Replacement flints for single flint striker. Fits "Forney" 86102 (sku #: 891.2586) and all standard screw-on type lighters. 5-pack. Replacement for Forney 70500 Chipping Hammer. Sturdy, high quality, carbon steel wire brush set in hardwood with hang hole. 4-3/4" (120.65mm) overall length (OAL) x 7/8" (22.22mm ) block x .014" (.36mm) carbon steel wire in 3 x 15 rows. Features a square hood and round file with a patented assembly. Includes four (4) replacement triangles for a total of 12 flints. Quality tool with a rugged frame and three (3) large flints. Long lasting round file and bright plated finish. Dependable ignition under all working conditions. Release slotted screw to rotate fresh flint into position. High carbon steel, tempered chisel on one end and point on the other. Black. Durable. All-purpose. Shock proof handle with loop for belt hook. High carbon steel. Tempered chisel on one end and point on the other. Durable. All-purpose. Shock proof handle with loop for belt hook. MIG contact tips are compatible with "Forney" (00306 and 00308), "Tweco", "Binzel" or "Clarke" MIG guns. It is precision machined. 4-pack. For Hobart, Handler 135, 140 (Forney 00355), 175 and 187 (Forney 00356), and Ironman 210 (Forney 00362) and 250 (Forney 00361). 3-pack. Tempered steel chisel to resist dulling during heavy duty usage. Impact resistant handle. Removable and replaceable brush (Forney 70501) for cleaning. 12" (304.8mm) overall length. 8" (203.2mm) long with 1-3/4" (44.4mm) wide jaw opening. Accepts up to #2 welding cable. Rugged, economical ground clamp for shop maintenance and field work. Good positive connection. Suitable for all farm and shop welders. Commercial-grade battery charger clamps with parrot-style zinc-plated jaws. Includes positive and negative clamps. Accepts up to #2 gauge cable. heavy duty construction and easy grip handles. 8.5" (215.9mm) long brass body with fiberglass cover and trigger. Accepts up to #2 welding cable and 5/32" (3.97mm) electrodes. Provides excellent conductivity and durability. Insulated for safety and maximum operator protection. Grooved jaws allow electrodes to be used at different angles for greater comfort and efficiency. One end has sharp blade with back bevel; other end tapers to a point. Flame treated hickory handle Sure-Lock wedged in tapered adze eye. 8.5" (215.9mm) long brass body with fiberglass cover and trigger. Accepts up to #2 welding cable and 3/16" (4.76mm) electrodes. Provides excellent conductivity and durability. Insulated for safety and maximum operator protection. Grooved jaws allow electrodes to be used at different angles for greater comfort and efficiency. 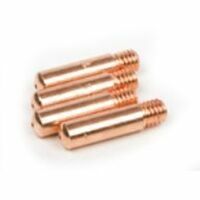 Features a high-efficiency bronze core heating element that heats quickly with a maximum tip temperature of 1,050 degrees F for burning and soldering capabilities. Tool stand protects tool from marking work surface. Ergonomic, stay cool design for control and comfort and a short shaft length for control of tip. Specs: 110/120 V/AC, watts 30/W, weighs 2.5 ozs. Includes: multipurpose tool, tool stand, convenient tip storage tube, general purpose tip, script tip, cutting tip, hot knife tip, soldering tip. 8" (203.2mm) long with 2" (50.8mm) jaw opening. Accepts up to #1/0 welding cable. Rugged, versatile, wide jaw ground clamp. Good for most grounding situations. Large contact surface area provides good cable connections and positive grounding. 7-3/8" (187.3mm) long with 1-1/2" (38.1mm) jaw opening. Accepts up to #2 welding cable. Includes shim stock and wrench. For heavy duty use. Large contact area assures positive grounding. Oval-point screw cable connections make installation easy, assuring good, safe cable connections. Wide grooved jaws for positive ground. Random orbit action for a fast, high quality finish, two handle for comfortable and ease of use, 10 ft cord. Specs: orbits/min - 4,400 OPM. Includes: waxer/polisher, (1) foam applicator bonnet, (2) wool polishing bonnets. Electronic variable speed. Soft-start for improved operator control. Die-cast aluminum gear housing. Extended rear handle design for balance. Two position auxiliary handle. Lock-on switch for extended use. Spindle lock for quick accessory changes. Converts easily from a sander to a polisher. No load speed 600-3000 rpm. Wheel size 7" (185 mm). Arbor size: 5/8"-11. Weighs 7 lbs. Accepts all standard 7" sanding and polishing accessories. Includes: 7" foam polishing pad, hook and loop backer pad, (1) 7" sanding disc, rubber backing pad, wrench and assist handle. Electronic variable speed control, spindle lock provides convenient accessory changes, self-stopping long life brush system, Quik-Lok cord provides instant field replacement for damaged cord, runs cooler and reduce swirl marks, use for clear coat finishes on cars. Specs: 120V/AC, pad size 7/9", no load rpm 0-1,750, spindle 5/8"-11, 10' Quik-Lok cord, double insulated, trigger switch, trigger lock, spindle lock, length 16-1/2", weight 8.8 lbs. Includes: polisher, side handle, 7" rubber backing pad, disc nut, nylon washer.